A cast circular lead token of Medieval or Post Medieval date. One side is decorated with a possible fleur-de-lis motif, the other side is decorated with a grid. It measures 18.5mm in diameter is 1.76mm thick and weighs 2.84g. 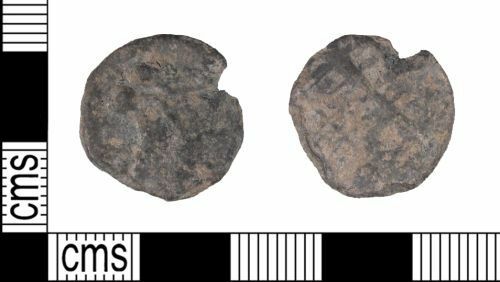 Lead alloy tokens had a wide variety of uses and were easy to manufacture; they are therefore difficult to date precisely outside of archaeological context. Tokens with simple designs are given a general date of c. AD 1250-1800. This token is a combination of Powell Type 4 (Lis) and Type 7 (Hatching or grids). Cf. Kerridge. R and de Ruiter, R. 2009. The Tokens, Metallic Tickets, Checks and Passes of West Sussex, 1650-1950. Laceys Printers Ltd. p. 235-6. Similar examples can be found on the PAS database: SF-40B2E4, SWYOR-904CC1 and CAM-F0B2B4.